Mark your calendars for November 11, 2006, and plan to attend "Encore: Another Evening with the Stars". Festivities begin at 6:30 p.m. with a social hour and silent auction followed by dinner and entertainment. St. John the Baptist Catholic Church Parish Hall is the place to be for this fabulouse fund raising event. Proceeds benefit the Alvin Historical Museum Exhibit Fund. For more details and ticket information, click on Alvin Historical Museum. 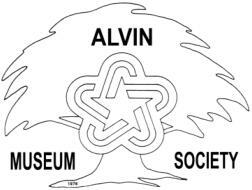 Alvin Museum Society will have a dual meeting on Sunday, August 27,2006. The fiscal year for the Museum Society begins on June 1. The annual business meeting will begin at 2:00 p.m. followed by the first quarterly meeting of the year. After refreshments, Bruce Taylor-Hille, Program Coordinator at the Brazoria County Historical Museum, will describe the annual Austin Town celebration in Angleton. Everyone is invited. Bring family and friends. See you at the Alvin Senior Center, West Wing, 2:00 p.m. Sunday, August 27! !